I'm back from vacation. Turns out, the haunted Rose Hall is a total fabrication, but that's not to say I didn't come away from Montego Bay uninspired. I'm hoping to have a new short story for you soon for the Halloween season. In the meantime, I realized that I had never posted "La Tutayegua" in its entirety on this blog before. Here it is. You can also download a copy on Smashwords, here. Enjoy, and may the Great Pumpkin bring you lots of goodies! My best friend has always been my cousin, Elena. But we have different grandfathers, so that makes us only half-cousins. Elena and I are the oldest. Elena’s two years older than me. She’s only got her little brother, Marcos. I got two little brothers, Alex and Christian, and then I got my baby sister, Veronica. Then there are two more sets of cousins, making fourteen kids in all in the family. I don’t really think of us as having a family tree, but more like those dark purple morning glory vines that grow on the back fence, tangled, their trumpet flowers choking out even the chain link, with Grandma Tata having been married five times. That’s how come we kids all look so different, even more different than you’d think cousins would be. My grandpa was Irish—the only white man Grandma Tata ever got married to, and out of all us kids, somehow I ended up the blackest. Chongo, Grandma Tata calls me. Monkey. Like a Puerto Rican. Now Elena is real pretty. She’s Grandma Tata’s favorite. Elena’s grandfather was from Mexico City and handsome like a movie star. He had French and Spanish blood, and was Grandma Tata’s second husband. She keeps a framed picture of him on the wall. He was very white, with brown hair. The way she sighs when she looks at that picture, I don’t know why they got divorced. Elena looks just like him, with her delicate bones, soft chestnut hair, and skin so white she seems to glow. Nobody had to tell Elena and me—we always knew we had a strange family. And not just because of Grandma Tata either. We all live on the West Side, at the top of a big hill. Grandma Tata says this is because when she was born here, Great-Great Grandma Jovita buried the afterbirth in the garden, so our blood is bound to the soil. Grandma Tata lives in the tiniest house, a little shotgun shack. Next door to her, is Great-Grandma Nimfa. We live across the street, and Elena and her mom live on the corner. My two uncles live in the neighborhood too, one on Jarboe Street, and the other on Mercier. See, ours was one of the first Mexican families to come to the West Side, back in 1918. Great-Great Grandma Jovita came here with her sister, Rosaura. They were the ones that raised Grandma Tata. They were witches and read fortunes for money. Then, once they got the house built – the house that Great-Grandma Nimfa lives in now – they planted a big garden. It’s hard to imagine now, but back then, the West Side was more like farmland, with people growing corn, and keeping chickens and cows and even pigs. A lot of people worked down in the Bottoms, in the stockyards, where they could buy their animals. My mom says the whistles in the Bottoms still blew until just a few years ago signaling the beginning and the end of the workday for the workers, and the cement staircases that were built into the sides of the hill so people could walk down to the yards and the meat-packing plants are still there, though now they’re covered in spray paint and chalk graffiti: Aztec art, skulls, the West Side Kings. After they’d been here a few years, Jovita and Rosaura grew an arbor of grapes to make homemade wine. They also brewed beer and bathtub gin. The hidden places are still there in Grandma Nimfa’s house, in the cupboards and closets, where they used to hide the bottles. My parents’ house is like that, too, only our family didn’t live there back then. It used to be a store. You can tell by how the roof isn’t like the roof on a normal house—it’s just squared off and tarred on top instead of shingled. And instead of just secret compartments, it has secret rooms—three of them. There’s one in the closet in my brothers’ room, one in the closet in the hallway, and then there’s one big room hidden in the hallway outside my parents’ bedroom—there’s woodwork along the wall, so if you know where to slip your fingers, the whole wall just slides back on a track, like a patio door. We don’t keep anything in those rooms now. Elena and I looked in the room behind the hall closet once. We didn’t go inside. I don’t know why, but those hidden rooms always seemed scary. It was just a bare linoleum floor, and an old plaster light fixture in the ceiling, and the air was stale. The last time my dad got arrested, he hid in one of those rooms. It was two summers ago, and very hot. The police came early—they liked to come early because they knew my dad would still be sleeping off the bender from the night before. They knew the patterns of Esteban Morales as well as if they lived in the house with us: for a few weeks or even a month after my dad would get out of prison, he’d be fine. He’d find a job and work on the house, all the time yelling about how he’d changed and things were going to be different now because he’d gotten clean in prison. And he’d be an early riser. As soon as he stopped being an early riser, that’s when you knew. And the police knew it too. They’d watch our house when he was home, just waiting for him to screw up. So the cops banged on the door early that morning. I crept down the hallway to listen to them talking to my mom through the screen door. “—didn’t come home last night,” I heard her say. “We saw him come home last night, Mrs. Morales,” one of them said. The front door opened and shut. They were in the house. Then I heard a soft noise that made me jump. The closet door was open a bit and I saw my dad. He’d moved the panel back just enough so I could see a bit of his face, and he put his finger to his lips. He pointed at the hamper. I nodded, and he moved back and replaced the panel, so you couldn’t even tell he was there. I dumped the hamper out on the floor of the closet. Then I went downstairs. The other cop glanced down at me. For a heart-stopping moment, our eyes met and I thought maybe they were going ask me questions, too. But they didn’t. Instead, they let my mom go upstairs and wake up Alex and Christian, and the five of us waited downstairs while the police searched the house, looking for my father. But they didn’t find him—just a pile of dirty towels. As soon as they left, I ran out the door, in my bare feet and pajamas, to Elena’s house. Elena’s mom, Aunt Tere, was getting ready for work. She found me a change of clothes and a pair of chanclas and sent Elena and me to take Marcos down to Grandma Nimfa’s. Grandma Nimfa took care of Marcos while Aunt Tere was at work. She took care of Elena and me too, but we mostly played outside. When we came in, she was cooking breakfast. The usual: eggs, bacon, fried potatoes, chili and tortillas. Enough for her, Marcos, Aunt Tere, Grandma Tata, my mom, my brothers, and anybody else who might wander in. The screen door at Grandma Nimfa’s banged open and shut all day long, with Grandma hollering at everybody to keep the goddamn gate closed. After we ate, Elena and I went riding our bikes. We were allowed to go around the block, but we weren’t supposed to go further than that—so of course, we went all over, explored everything. We went down to Southwest Boulevard, up Kansas Avenue to Argentine. We were friends with the Peregrino kids who lived down in the West Bluff projects off 23rd who would usually come ride with us a while, maybe play some kickball over at Observation Park. We’d go up 17th. The roads were built narrow around them old neighborhoods because streetcars used to come through there. The houses leaned in close to one another. In some places, there were just foundations where fires had taken out whole rows, leaving nothing but the basement and crumbling stone stairs leading up to nowhere, grown over with weeds and tall grass. The old Switzer school stood empty along West Pennway, its windows boarded up. My dad went there when he was a kid, but not Elena’s mom—Elena’s mom got a scholarship to a girl’s Catholic school over in Brookside. Sometimes, we’d take our bikes up Beardsley Road. We loved to go up to Crown Center or to the River Market. At the Market, there was an old fruit vendor who was friends with our Great-Grandpa Jose who would give us free pears and fistfuls of cherries we carried bunched in our shirts, shedding stems and pits as we ate them, getting our hands all sticky. But our favorite place to explore was the West Bottoms-- the trains and the railroad tracks, the old buildings, the riverside. That day, Elena and I coasted our bikes down the hill on Holly Street to Beardsley, always shady even on the sunniest days, the steep limestone bluff rising along one side, spotted with trees and brush until, dozens of feet above our heads, the highway straddled the barrio, I-70 and I-35 branching out into Kansas. But we didn’t even hear the buzz of the traffic—we’d lived with the noise in our ears our whole lives, like the rap and Mexican music blaring from drug dealers’ boomboxes. It was starting to get late. The sun was setting behind the smokestacks, and the grind of the cicadas drowned out even the cars rushing by on the overpass. The place where the Missouri and Kansas Rivers met, usually brown, reflected the sunset colors, firework colors, candy colors, red, pink, orange, yellow. As usual, Elena rode a little bit ahead of me, her brown ponytail bouncing against her shoulder blades. Being two years older, she was always taller and sturdier. I’d always be skinny. Even when Dad wasn’t around, my mom wasn’t much of a cook. If we got fed, it was because of Grandma Nimfa and Aunt Tere. I remember Elena was wearing a white Mexican blouse, very bright in the dim light. I remember it had red and purple embroidery around the collar. The other girls in the neighborhood made fun of her when she wore things like that, made fun of her for being so white. But they were just jealous because she was pretty and spoke better Spanish than anybody. Elena turned off Beardsley to go into the Bottoms. It was under the 12th Street Bridge that we saw her. We’d heard the stories all our lives. Not just from other kids, either. Grownups swore up and down that they’d seen her—La Tutayegua, the old folks whispered. The Horse Lady. Some said she was a girl who loved horses. One day, while she was out riding, she and her horse were swept away in a flash flood. Others said she worked with her family in the stockyards, rounding up horses for auction, and got trampled to death. Either way, now she haunts the riverbend and the Bottoms with the body of a young girl and the head of a mare. People even say they’d seen her on the steep staircases that zigzag crazily up and down the hillside. We’d gotten off our bikes to walk them along under the bridge and there she was-- in the shadows, back along the side of the bluff, staring at us. Her head was black, blacker than the shadows around her, blacker than anything you can imagine, with a long, slender muzzle and a black mane, her eyes bright red. Even though it was summer, the air around her seemed cold, so cold I expected us to see steam coming out of her nostrils, but she was as still as if she’d been painted there. Her body was a woman’s body—or was it more like a girl’s? She was only about as tall as Elena, thin, wearing a long, old-fashioned blue dress, so faded it was almost gray. From underneath it, a pair of heavy hooves peeked out. When we saw her, we froze, too scared to move. I don’t know how long we stood there until at last La Tutayegua lowered her head and took a step back. Her hooves made no sound against the soft earth as she faded against the wall, the little red flowers on her dress we hadn’t noticed before standing out against the damp concrete embankment. The last thing we saw was her red eyes hanging in the air before they, too, faded out. Then we turned and ran, not even thinking for several hundred yards that we ought to get on our bikes. But when we did, we pedaled harder than we ever had before in our lives. By the time we got back to our street, we discovered goose bumps had broken out all over our skin, and we were shaking all over, even though we were soaked with sweat from the hard ride. The streetlights were coming on. We skidded to a halt in front of Grandma Tata’s house, and sat balanced on our bikes, panting. What stopped us was the sight of my dad running up the sidewalk towards us, wild-eyed. A pair of police officers was chasing him. They’d hidden their car around the corner and waited for him to come out of the house. When he was sure my dad couldn’t move, the cop sat back, swiping his arm across his brow. Raising his eyes to mine, I saw that it was the same cop who’d come to the house that morning. So they took my dad away again. It was always someplace far away, where we couldn’t go visit—we never had a car, and even if we did, we wouldn’t have been able to afford the gas to Jefferson City, Springfield, even Leavenworth. But it didn’t matter. For a while, things were all right. My mom was always a good worker. She saved some money, got us a new TV. Living with Esteban Morales was like living in the path of a storm. You knew that sooner or later everything was going to get blown to bits. But then he’d be gone and we’d forget for a while. We’d forget what it was like for him to wake us up in the middle of the night and send us out to go door to door, begging the neighbors for money and cigarettes, even in the winter. We would forget what it was like to have him distract store clerks so we could shoplift stuff for him. We would forget what it would be like to have the phone shut off, the lights, water and gas shut off, because he took everything. My brothers and me, we would forget what it was like to see him go crazy and start beating on our mom when she had nothing left to give him, the screams and the tears and the bruises. The holes in the walls, the broken screen door. Or maybe it wasn’t that we’d forget so much as that we wouldn’t say anything, because even when he wasn’t home, we’d hide our stuff, find other places to stay. Alex found the key to the circuit box, which was on the wall behind the refrigerator in the kitchen. That’s where he hid his money—birthday money, Christmas money. By the time he was seven, he was going around the neighborhood with a weed whacker, doing yard work, raking lawns, bagging leaves. And worst of all, we’d shrink from police cars, because we knew that the cops were eyeing us because we were Esteban Morales’ sons. I would go stay at Elena’s house whenever I could. Aunt Tere would let me stay, sometimes for days. They’d make me up a place on the floor next to Elena’s bed. I even had my own toothbrush and changes of clothes there. But I would always go back home. Because I had my mother, and my brothers and my sister. This past fall, Elena turned eleven. In December, she got her period. Nobody told me. I just knew. I knew by the way she got up quietly in the middle of watching cartoons after school and went to the bathroom. When she came back, her face was different. When I went into the bathroom after her, I saw the pink wrapper in the trashcan. Over the next few days, she was very quiet. I saw her hugging herself when she thought I wasn’t looking. A few days later, Grandma Tata decided it was time to give her Jovita’s things. She took Elena and me into the back room at Grandma Nimfa’s house. The room had been a bedroom once—and there was still a bed with a faded green polyester bedspread, mostly buried now with junk, the nightstands with old gold lamps. Grandma Tata had to stand on a chair to reach the shelf in the closet, and took down an old wooden box. There was all kinds of strange stuff inside: a bull’s horn, a railroad spike, stones, shells, charms, bowls, and something that looked to me like a tiny molcajete, except smooth instead of grainy. There were also two decks of cards tied with ribbons, one large and one small. None of it was for me, of course. I was too young, and a boy. But later that evening, Elena let me look through the box with her as we sat in her room. There was a pack of Hostess cupcakes between us. “What are these?” I asked, picking up the smaller deck of cards. They all had brightly colored pictures on them, and words in Spanish. I could read most of them, but not all. “Well, there’s no board. And these cards are really old, see?” she held one up carefully. The edges were soft, creased with age. She shrugged. “I don’t know.” Flipping over another card, she read, “The hand. La mano del criminal.” For a minute, neither of us said anything. “No,” she whispered, and drew the last card. “Nah.” I held up my hands, but still she held them out. So I took them. 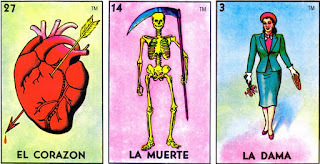 I looked at them many times—so many times I probably have all the cards memorized now, with all their little riddles. La sirena. La sandía. El camarón. But I couldn’t help but feel sad. I could already feel her starting to slip away. I was the only one who knew her favorite thing was a little piece of rose quartz as round and perfect as a marble that she carried around in her pocket. She was the only one who knew I had once stolen a library book, Animalia, because I loved the pictures. We used to sit together and look at it, trying to spot everything that started with D, everything that started with E. But when Grandma Tata gave her the box of magic things, she added her piece of rose quartz in with the other stones. And as the weeks went by, she had less and less time for me. She spent more time with Grandma Tata, or with Grandma Nimfa, learning to cook and garden and mix up herbs. And of course, she had her homework. Elena was always a good student—much better than me. And then one day, Aunt Tere decided to take Elena to work with her. Aunt Tere was a secretary during the day, but made extra money at night cleaning offices. The man who ran the cleaning crews agreed to let her bring Elena along and would pay her under the table. That March, I turned nine. And we found out my dad was coming home. After two years, he would just be there, like nothing had happened. His hair freshly combed, his shirt pressed, his cowboy boots spit-shined. This time, he had a new tattoo on his left arm: La Anima Sola, beautiful even in her chains, brown-haired, bare-armed and white, surrounded by fire. And all the while, the police cruised the neighborhood, watching. I wasn’t surprised when I came home one afternoon and found him passed out on the couch in his underwear. By summer, he’d sold the TV, our bikes, even Alex’s weed whacker. When my mom got her tax refund, he wanted her to sign the check over to him. She said no. So he beat her so bad, I thought he was going to kill her. So the night that he woke me up and told me I was going to work with him, I said okay. We walked over to a house on Jefferson where nobody was home. We went around the side of the house. He boosted me up so I could climb in through the window. I was so skinny, it was easy—easy for him to lift me, easy for me to shimmy through. When I got inside, of course, it was dark. The house was nice and cool, air conditioned. I felt my way around until my eyes adjusted, then I found the back door so I could let him in. We didn’t turn on any lights. While he went into the bedroom, I went to the kitchen. I found a package of Chips Ahoy cookies in the cabinet. Sitting on the countertop, I swung my legs and ate my way through most of the pack while my dad went through their drawers and closets. I don’t know how long we were there-- maybe half an hour, maybe a little longer, when a flash of light illuminated the living room. Headlights. The people who lived there were home. I jumped up and started to run towards the back door, but the driveway curved around the side of the house—they’d see us, for sure. So I turned back towards the window where we’d come in. At least, I thought it was the window where we’d come in. I ran headlong into the glass, smashing it. It cut me all up. But the worst of it was when the broken pane above fell down on me. And then—what can I tell you about what came next? I can scarcely remember. I must’ve passed out between the house on Jefferson and here. All I know now is, I’m lying here in the dark, on a dusty floor. The air is very stuffy and stale. On the other side of the wall, I can hear my parents fighting. My father doesn’t want to take me to the hospital, even though I’m all cut open. My mother is screaming at him. The police could be here any minute and what are they going to tell them? I hear the rustling of clothes—my father changing his shirt to hide the blood. My hands are very wet and sticky and I’m afraid to move them. I think I’m holding my guts in—a thought so scary my body goes stiff when I think it, and it hurts so much that I can’t even cry, and all I can do is draw in these shallow little breaths, and it’s like the world gets a little darker every time my heart beats. I shut my eyes tight and try not to think about it, try not to think about my parents fighting, about the police who are coming. I try not to think of Alex and Christian and Veronica, who must be in their beds, listening to them fight. Wondering where I am. I try to think of good things. Grandma Nimfa’s garden and tortillas. Midnight Mass. Riding my bike. Setting off M-80s in the park. Pictures in a book. Elena. As I lay there in the dark, I hear the policemen knock on the door downstairs, and I realize suddenly that I am no longer hot. It’s gotten very cold. I open my eyes. Standing next to me is La Tutayegua, but this time, her dress—it looks brand new! The cloth is velvety and dark, with a lacy white collar, the little flowers fresh and red as strawberries. And her head isn’t black, but chestnut, the mane rich and glossy. She is looking down at me with soft brown eyes, no taller than Elena. Suddenly, I don’t hurt anymore, not at all, and I stand up. I realize we are the same height—when were Elena and I ever the same height? Behind her, the wall opens up and I see a beautiful clear river. On the opposite shore is a sandy bank, and a bird swoops low overhead that I know must be a heron. I know good things are waiting for me there. I have but to take her hand and step through the wall. And I know that the police won’t find this hidden room—they didn’t in Great-Great Grandma Jovita’s time. They won’t in my father’s time. But when my parents slide back the panel, they won’t find me there either. All they will find is a little bit of blood, and in the middle of the floor, three lotería cards: Death, the Lady, and the Heart.